I had no idea we were going out last night until my wife called me on my way home from work to inform me that Joe and Carol B. would be picking us up at 7:15 and we would be meeting Jerry and Sue C. at Rustico on Berlin-Cross Keys Rd. in Sicklerville. Berlin-Cross Keys Road, for as long as I can remember, was nothing more than a slightly treacherous stretch of asphalt that connected the Black Horse Pike with the White Horse Pike and points behind. It was the “back way” to Cherry Hill and Marlton. None of that is true any more. It’s like I went to sleep one night and when I awoke I found that 30 million construction workers had converged on the entire roadway and transformed it from farmlands to, not just one or two, but a multitude of mega shopping areas. It’s little wonder we had only a vague idea of which strip mall contained our dining destination, Rustico. Fortunately, Joe and Carol were excellent navigators and we found the location without much difficulty. Let me start by saying that Rustico is worth finding. Maurizio De Luca and his family have created a warm and inviting dining destination where you can enjoy some good eats without breaking your dining budget. It’s also a BYOB so you can bring your favorite bottle to compliment your meal. Last night I brought a 2005 Hug Cellars Paso Robles Syrah. Hug Cellars makes several different bottlings of Pinot Noir, Syrah, Cab and Zinfandel from single vineyards in the Paso Robles area. Virtually all of their wines are made in limited quantities (182 cases of this Syrah) and not found in many of our local wine shops. I found this and a Pinot Noir at Hops n Grapes in Glassboro in the $20 range. This was a nice bottle of wine with plum and blackberry flavors, a hint of black pepper and supple tannins producing a smooth finish. 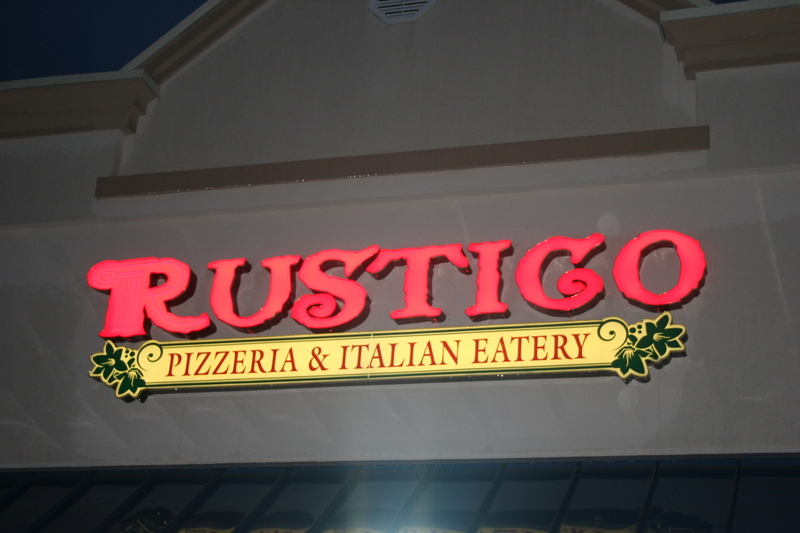 The Rustico menu offered lots of choices in both the Pasta and Entree areas in addition to tons of sandwiches and specialty pizzas produced in their brick oven. 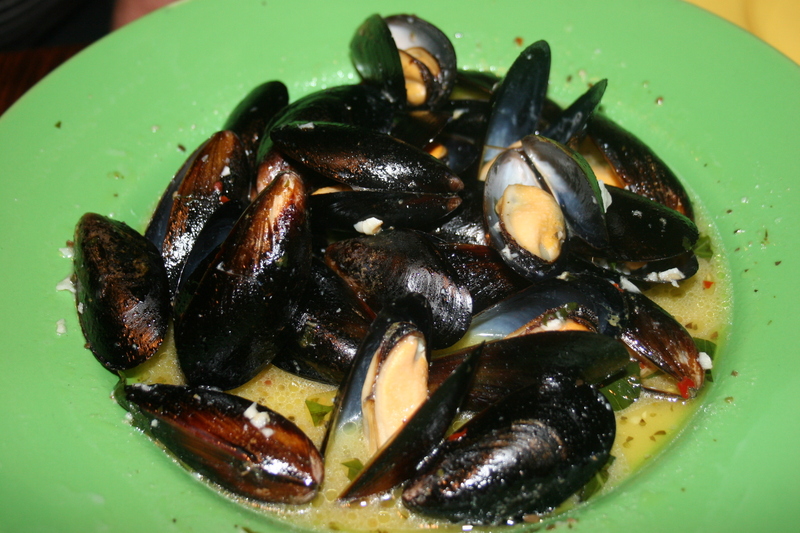 Jerry and Joe split an order of Mussels in white sauce. They mentioned that I don’t usually photograph mussels since one plate of mussels usually looks like another. I told them I liked the green plate. They liked the mussels. They REALLY liked the juice and requested extra bread for dipping. Their only minor complaint was that the dish contained several unopen mussels and although that happens with lots of mussel dishes there were too many in this one and they should have been removed before serving. They told me all of this while constantly dipping bread into the leftover sauce and making little “mmmmmmmm” sounds between bites. 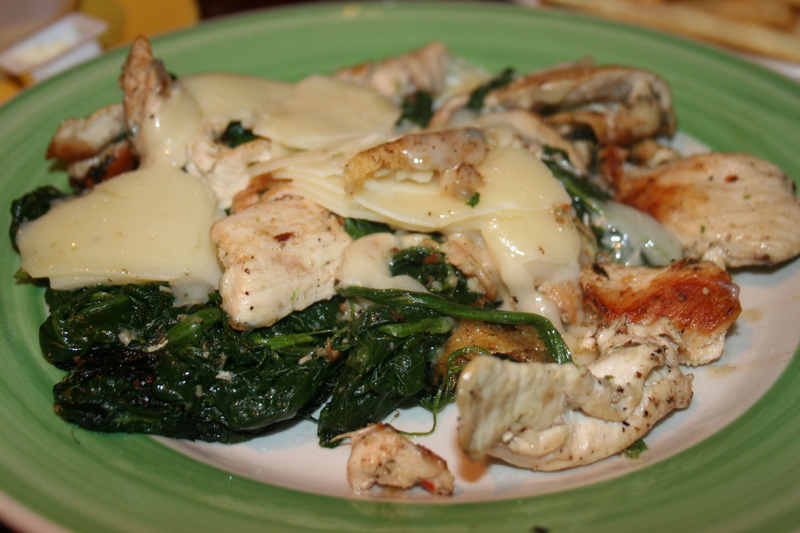 There were a few chicken selections among the six of us and I was one of them with my Chicken Florentine. 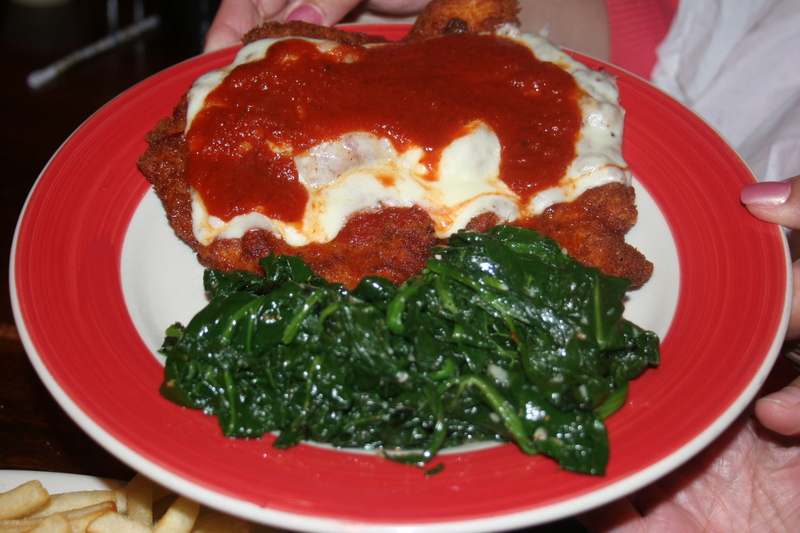 Two tender, thin sliced breasts of chicken on a bed of spinach served with a side order of capellini. 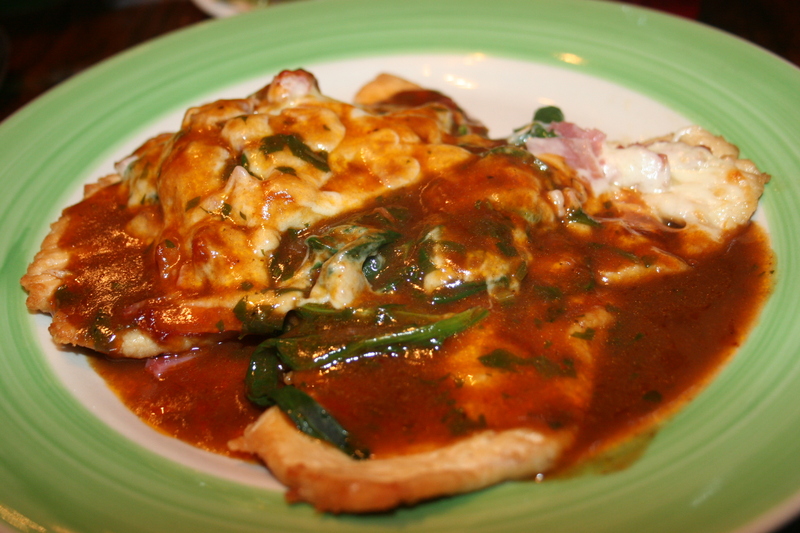 The chicken was nicely prepared, the spinach tasty and the sauce was delicious although it was neither red or white or even blush. It was a reddish brown and had great flavor. I could have finished the meal and been full but I saved a portion for today’s lunch. Sue C. did something with what should have been a Chicken Italiano sandwich. For a second, I thought I was sitting next to Jack Nicholson in Five Easy Pieces. “Could you take the chicken off the bread, keep the spinach and mozzarella and replace the fries with a side order of veggies and then just serve the entire thing on a plate?” I think the final answer was “yes AND no” because she still ended up with a side dish of fries. 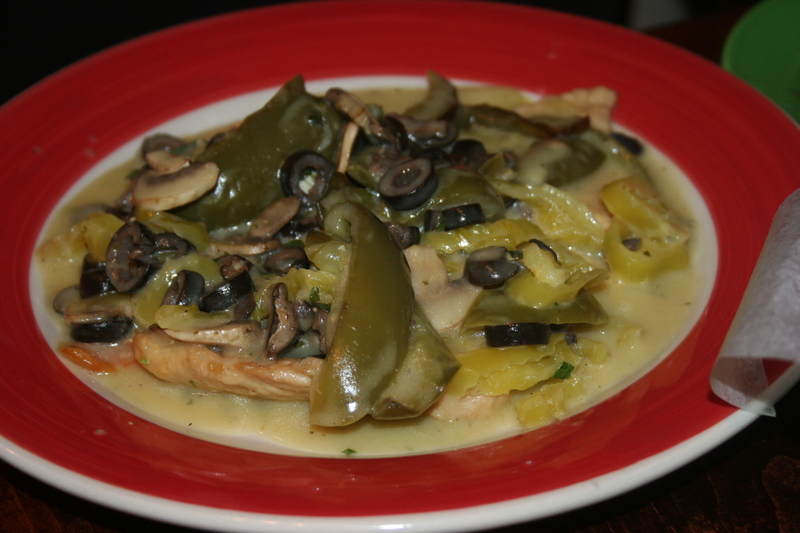 Joe ordered the Chicken Siciliano, with roasted peppers, olives, mushrooms, hot peppers and butter in a wine sauce. He gave it two thumbs up. 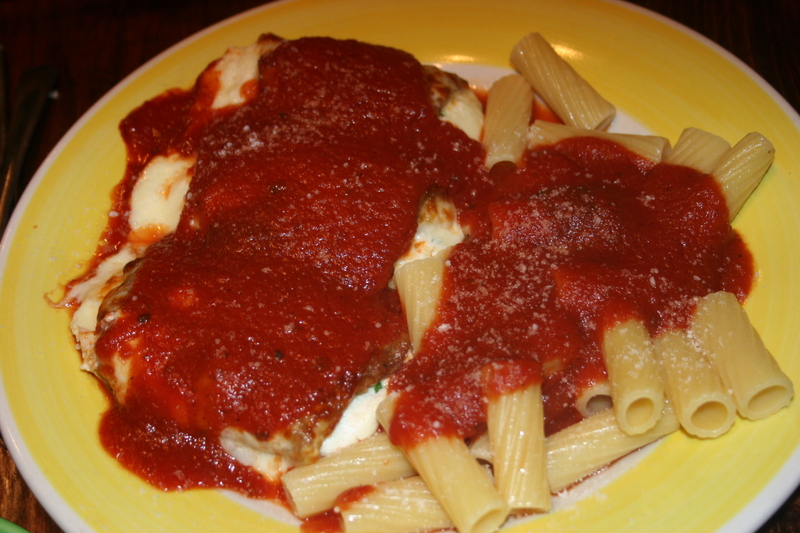 Carol had the Chicken Parmigiana and thought it was very good and Jerry was pleased with his Eggplant Rollatini. All of the entrees were accompanied by your choice of salad, vegetable or pasta. My wife, Kathy, ordered a personal size brick oven pizza and although I neglected to take a photo of it she managed to bring a couple of slices home with her. We passed on dessert and went back to Jerry and Sue’s house for coffee and cake. Rustico is an excellent value with good food and great prices.